The previous post summarised the consequences on a tangency portfolio’s asset weights, returns and risks of extending the base case scenario (2 risky assets and 1 risk free asset) by including a third risky asset. 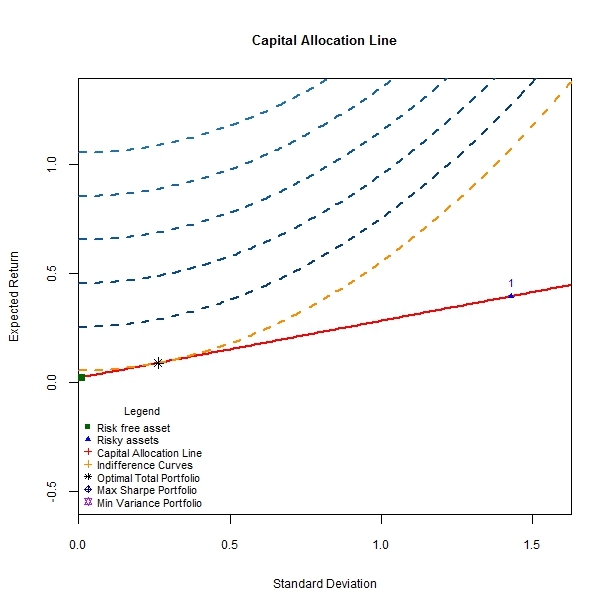 The additional asset is constructed in such a way as to command a mean return and risk in excess of those provided by asset number 2 of the base case scenario, while simultaneously being less risky than asset number 1 of the base case,commanding a lower mean return with respect to the same until successive incarnations of that additional asset finally dominates base asset number 1 along both dimensions of interest. By fixing the new asset’s risk to occupy an intermediate spot between the base assets but varying its mean return to increasingly higher levels,one would expect its optimal weight in the tangency portfolio to increase (as it does). The two fund separation theorem decomposes any investment problem into  finding an optimal combination of risky assets and  finding the best combination of this optimal risky portfolio and the risk free asset. While the first part of the problem can be addressed independently across different investors without accounting for individual preferences,the latter part of the investment problem must be addressed in relation to the trade offs between risk and return that an individual is willing to incur. As we have seen several posts ago, individual preferences can be captured using indifference curves and utility functions. 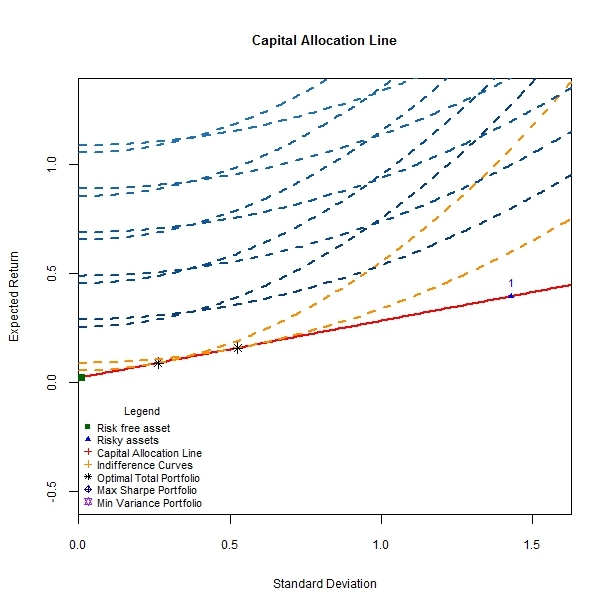 The total optimal portfolio, itself a combination of the optimal risky portfolio and the risk free asset, emerges at the tangency between preferences (as governed by utility functions and indifference curves) and investment opportunities (as governed by the capital allocation line that connects the riskless fund with the optimal risky fund). While the previous post was concerned with issues surrounding the optimal risky portfolio, this post will concentrate on the total optimal portfolio. The objective here is to track how optimal asset weights change across individuals with different risk preferences using the framework defined in previous posts. Each investor will be associated with (and identified by) a unique risk aversion parameter ranging from 1 to 5 with increments of 0.5 separating successive agents. Intuitively, a higher risk aversion parameter should be associated with a total optimal portfolio that is less invested in the optimal risky fund than the riskless fund. The converse should be true for lower values of the risk aversion parameter. 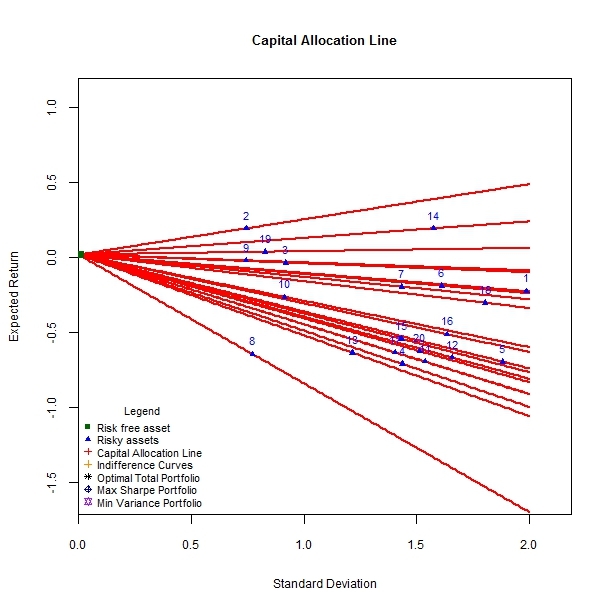 In the code above,we simulate 15 random assets, plot them in the risk/return space along with the minimum variance frontier that they span,the optimal risky portfolio (tangency portfolio) that emerges from the markowitz procedure,the capital allocation line (CAL) that connects the riskless fund to the tangency portfolio, as well as the optimal total portfolios that emerge as points on the CAL. Since each investor is presumed to face the same universe of risky assets, the differences across total optimal portfolios across various agents depend on the associated risk aversion parameter. The dashboard of plots follows. 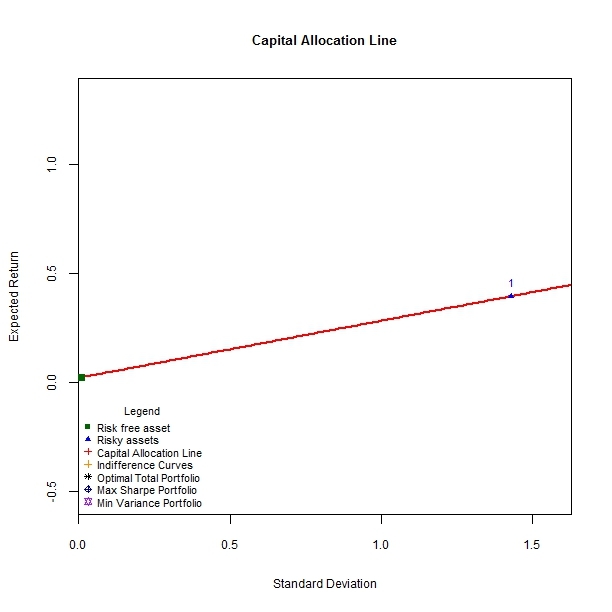 While both transition maps are defined relative to the risk aversion parameter,I have separated the risky asset weights and riskless asset weights to better emphasise the point of the two fund separation theorem as well as making visualisation less muddy. The results corroborate the intuition that greater values of the risk aversion parameter are associated with increasing proportions of the total optimal portfolio being invested in the riskless fund. 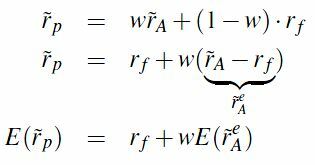 The transition function was adapted from alphaism and systematic investor. Young investors should allocate a disproportionately large amount of their investable capital to risky securities within risky asset classes. Older investors should allocate a disproportionate amount of capital to less volatile securities within less risky asset classes. (1.) Finding the optimal portfolio of risky assets. This amounts to finding a vector of weights associated with risky assets that maximise the risk adjusted return of the resulting portfolio. An important consideration here is the selection and use of an appropriate risk-adjusted performance measure. (2.) Finding the best combination of the risk free asset and the optimal risky portfolio. Once the optimal risky portfolio has been determined, it can be combined with the risk free asset; with respective weights in each of these ‘funds’ subject to individual risk preferences, the total portfolio can be constructed. The most important implications of Modern Portfolio Theory can be summarised as follows. Investors should control total portfolio risk by varying the amount of capital invested in the risk free asset and the optimal risky portfolio as opposed to changing the composition of the risky portfolio itself. The weight given to the either ‘fund’ depends on the individual’s risk aversion. It should be noted that most of the relevant results are derived under the assumptions that either [a] all returns are normally distributed or [b] investors care only about mean returns and variance of returns. Further assumptions require that all assets be tradable and no transaction costs are incurred when trades occur. Before the Two fund theorem can be implemented, a theoretical framework for understanding the tradeoff between risk and return will be briefly sketched. 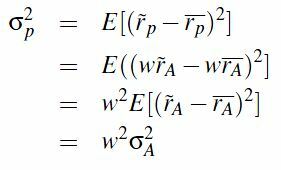 The standard utility function of choice is the power utility function, also known as constant relative risk aversion or the CRRA utility function. with A representing the risk aversion parameter. If assets can be thought of as providing a benefit (returns) at a cost (risk), then a simple way to visualise the tradeoff can be attained using Indifference curves. To illustrate these and other issues of this post, the following two helper functions,utility.contours and contours.plot were written. 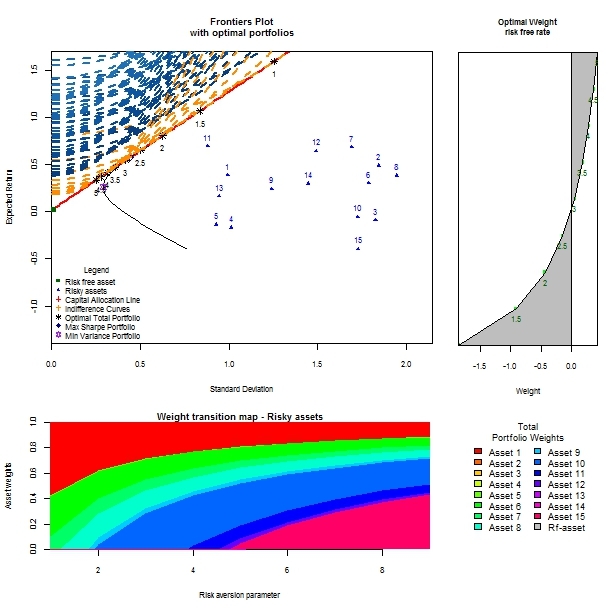 The plots above illustrate the CRRA utility function as well as its first derivative (or marginal utility function). The greater the risk aversion coefficient ,gamma, the greater the curvature of the utility function, the more risk averse an individual, the larger the amount of money (the certainty equivalent) required to make that individual indifferent between receiving a particular money amount with perfect certainty and obtaining that amount as an expectation of a gamble. 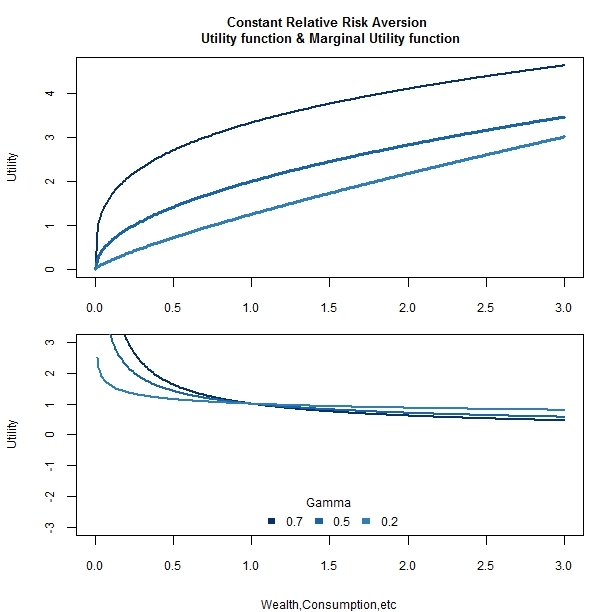 The slope of the utility curve,as depicted in the bottom plot as the first derivative of the preceding function , suggests that the additional utility derived from an extra unit of wealth declines as the amount or level of wealth increases. While utility derived increases with wealth, the rate at which an additional unit of wealth promotes greater utility decreases over rising wealth. The first plot depicts the effect on indifference curves of varying the risk aversion parameter while holding utility constant. The converse is true for the second plot, in which the risk aversion parameter is held constant across varying degrees of utility while indifference curves are charted. True to its name, an indifference curve connects all combinations of (in this case) risk and return which yield the same utility. 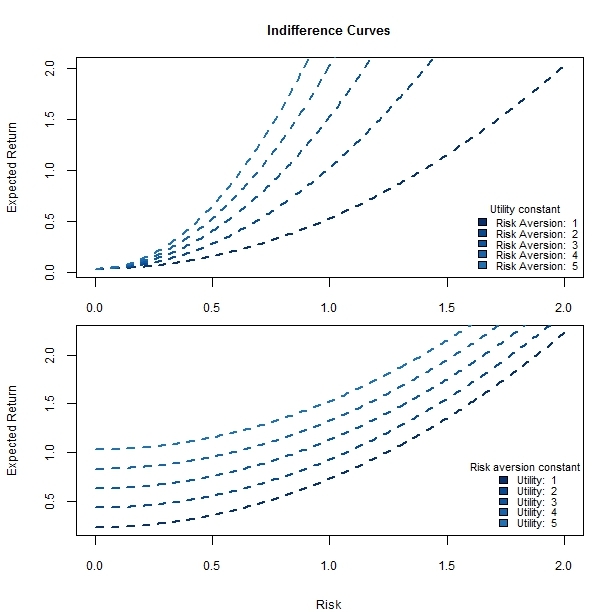 With respect to the first plot, the greater the risk aversion of an individual, the greater the expected return required for a given level of risk before the specified level of utility can be reached. With respect to the second plot, northwesterly movements of the contour signify combinations of risk and return that yield greater utility. Intuitively, when risk aversion and risk are held constant, the asset that provides greater expected returns would command greater utility. An investor, who regards assets as bundles of risks and returns, would wish to hold a portfolio of assets that are located on the highest possible indifference curve for a given aversion to risk.